The Progressive music groups various musical styles with a progressive approach. Among them, the Progressive Rock achieved the most commercial relevance. 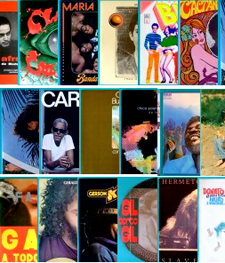 But many styles joined the Progressive mood, including Progressive Folk, Latin Progressive, Progressive Soul / Funk, Progressive Jazz Fusion, Progressive Experimental, Progressive Regional, Progressive Pop and others. But, after all, what is the Progressive Music? Which are its features? This genre was heavily influenced by the Erudite (classical) music. Its main features are the lengthy of the song (sometimes over 20 minutes long), melodies and harmonies modulating with several distinct movements (such as Suites of classical music), a form that generally ends returning to the starting point motive. In some songs, parts of classical music are incorporated; in others, sound collages are used. The Instrumentation is also wide: all orchestration resources can be available, such as electronic instruments (Synthesizers, Mellotron, Theremin), Symphonic Orchestra, Flute, studio sound effects experimentation and the usual formation of a pop rock band. The musicians seek to be virtuoses on their instruments, which is demonstrated in their long solos. In the Worldwide Music, some artists that represents this style are: Yes, The Nice, Emerson Lake & Palmer, Tangerine Dream, Focus, Camel, Los Jaivas, Pink Floyd (also classified as Psychedelic), The Moody Blues, Kraftwerk, Jethro Tull, Supertramp, Triumvirat , Genesis, Renaissance, Electric Light Orchestra, Dream Theater, Gentle Giant, King Crimson, Soft Machine, Van der Graaf Generator, Premiata Forneria Marconi, Le Orme, Procol Harum, Nektar, Acqua Fragile, The Alan Parson’s Project, Popol Vuh, Can, Mike Oldfield, Strawbs, Curved Air, Marillion etc. In Brazil, artists that represents this style are: Bacamarte, O Terço, Mutantes, Terreno Baldio, Som Imaginário, Recordando o Vale das Maçãs, Módulo 1000, Tim Maia (Racional), Sérgio Dias, A Bolha, Alpha III, Anno Luz, Som Nosso de Cada Dia, Carioca & Devas, Quaterna Réquiem, Grupo Água, Comunidade S8, Moto Perpétuo, A Barca do Sol, 14 Bis, Apocalypse, Tellah, São Quixote, Sagrado Coração da Terra, Raiz de Pedra, Casa das Máquinas, Pão com Manteiga, Ave Sangria, etc.